PALM COAST, Fla. – If his players were going to really learn how to play in the wind – flight shots, keep them low and still be able to score – Jay Moseley knew Ohio alone wouldn’t cut it. So when Moseley’s senior-laden Ohio State team took a trip south for winter fine-tuning, developing a wind game became a priority. It may sound odd to leave the Midwest to hone that skill, and Moseley chuckled a bit when he acknowledged that. It’s just that he was nearly drowned out by his Buckeyes whooping behind him as they passed around a Big Ten Match Play trophy (Ohio State’s first in the 14-year history of the event) and loaded up their bags at the end of an exhausting 36-hole day. 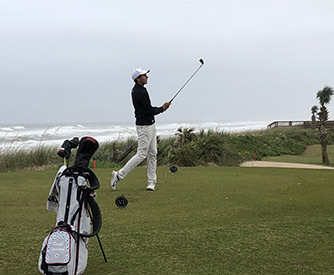 Big Ten Match Play, played on the beautiful but exposed (read: gusty) Hammock Dunes Resort’s Conservatory and Ocean courses, was a good time for Ohio State to shine. Camera crews followed every move of the championship match between Maryland and Ohio State on Feb. 9, and it all ended under a TV spotlight for the trophy presentation. The action will be broadcast on the Big Ten Network. The semifinals and championship match went off on an overcast day with wind gusting off the Atlantic, but Ohio State put on a show worthy of televising. The Buckeyes won 4.5 to 1.5 in the six-man event. Only one match, between senior Daniel Wetterich and Maryland’s Peter Knade, even reached the 18th hole, where the two halved. The spring-opening event featured all 14 teams in the conference and was flighted according to fall season-ending Golfstat ranking. That left Ohio State seeded No. 4. After winning its opening matches against Rutgers and Wisconsin, the Buckeyes went up against top-seeded Illinois. It’s a team that has, as Moseley says, a target on its back for a reason. The Illini have won four consecutive Big Ten Conference Championships and are No. 27 in the Golfweek/Sagarin College Ranking. Only three Big Ten teams have ever made it to the eight-team bracket since match-play was added to the national championship in 2009. Ohio State’s only trip was in 2011. But Illinois has made it six of the past eight years, reaching the championship match (where they lost to Alabama) in 2013. “We feel like we’ve made some positive gains and have some players that can really match up with them,” Moseley said of facing Illinois. His team backed up that feeling with a 3.5 to 2.5 defeat of the Illini. Three Buckeyes – Kevin Stone, Will Grimmer and Daniel Wetterich -- never trailed in their matches, winning 20 holes between the three of them. This marks Moseley’s fourth season in Columbus. The core of his team is made up of seniors, among whom only Grimmer and Caleb Ramirez have been there all four years. Wetterich, an Ohio native, transferred from Xavier after his freshman year and Will Voetsch came from Rice after two seasons. Grimmer and Wetterich, who both logged top-20 finishes in last week’s Jones Cup, are the frontmen. Grimmer most often flies the Buckeye banner, having qualified for the U.S. Open twice in the past four years. He was undefeated in Big Ten Match Play last year, and this year won two and a half points (out of a possible four) for his team. For his part, Grimmer is simply trying not to put too much pressure on himself. Ohio State, ranked No. 55 in the Golfweek/Sagarin College Rankings, won the Musketeer Classic to end the fall. They lapped the field by 18 shots. The Musketeer was Ohio State’s first team title since 2014, and the first road win since 2012. “It’s very exciting to see how good this team can be,” Moseley said after that triumph. Big Ten Match Play further demonstrated that, and Wetterich – a man who Moseley calls “the silent assassin” – echoed the sentiment. OPPORTUNITIES ABOUND FOR WOMEN: Female amateurs have another event to add to the calendar this summer. The creation of the Amateur Golf Alliance Women’s Championship comes on the heels, of course, of the Augusta National Women’s Amateur and also the Donna Andrews Invitational. While the latter is inclusive for amateurs of all ages, the AGA’s event goes one step further: it will be simply for female amateurs age 23 and over. In other words, it’s an opportunity for players post-college. The 78-player field will be limited to players with a USGA handicap index of 6 or less. The event will be played at Coral Creek Club in Placida, Fla., from June 6-8. Exempt players include the past five U.S. Women’s Mid-Amateur champions; the past three U.S. Women’s Mid-Amateur runners-up; U.S. Women’s Mid-Amateur semifinalists from the past two years, quarterfinalists from 2018 and the top 15 stroke-play finishers from 2018 plus top 10 stroke-play finishers from 2017; top 15 stroke-play finishers from the 2018 U.S. Women’s Amateur; the top 500 players in the Scratch Player’s World Amateur and the top 300 in the World Amateur Golf Ranking. The AGA and host club will also have a maximum of six selections. TIME TO STUDY: If we learned one thing from watching professionals navigate the first month of competitive golf in 2019, it’s that the modernized Rules of Golf require a bit of studying and a bit of memorization. With that in mind, college golf teams have called in rules experts for a pre-spring refresh. It’s never a bad idea to brush up – you never know when it will give you an advantage. The question is, how much? College coaches will have a huge impact this spring (positively or negatively) depending on how well they teach their players the rules and pay attention during tournaments. The skinny: The first boys AJGA Invitational of the spring, and one that always draws the best players in junior golf. The list of past champions is impressive – from Rickie Fowler to Jordan Spieth to Brad Dalke. The skinny: A 36-hole best-ball event that typically draws some of the strongest female mid-amateurs in the game. Past champions include U.S. Women’s Mid-Amateur champions Lauren Greenlief and Meghan Stasi and U.S. Senior Women’s Amateur champion Diane Lang. The event dates to 1946, when Louise Suggs was one half of the winning team. The skinny: The Purdue-hosted event will draw a field strong in northern and Midwest talent as the spring season kicks off in force.